Sign up by April 28th to receive an exclusive offer from Sport Chek with your bib registration. Be part of the tradition! For more than 40 years, Calgary families have made the Sport Chek Mother’s Day Run -Walk - Ride a part of their Mother’s Day tradition. 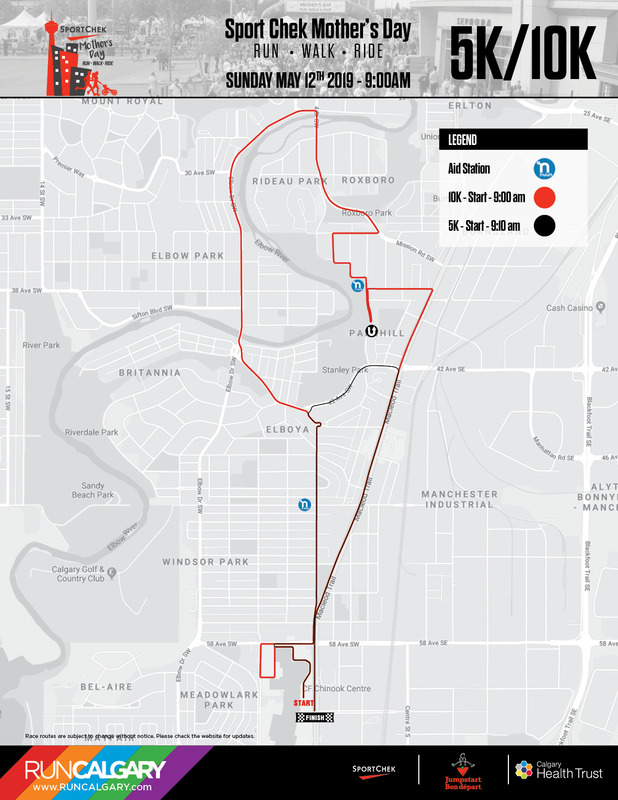 In 2019, The Sport Chek Mother’s Day Run, Walk & Ride has partnered with Run Calgary, the organizers behind Calgary Marathon, to build on its 40-year legacy. While the race will stay true to its roots, celebrating mothers, starting and finishing at CF Chinook Centre and raising funds for both the Calgary Health Trust NICU and Canadian Tire Jumpstart Charities, participants can expect a refreshed look and feel for top-level racers, individual fundraisers and families celebrating Mother’s Day. Please note that each participant will be charged a processing fee of $5.50 plus 5% GST tax in addition to the race entry fee.